FUTURE GENERATIONS BY 2020 with far-sighted vision will look back and hardly see that the ‘Jewish Question’ has left a few with troubling consternation. Not that the question of Jewish unbelief is even relevant…nonetheless, it’s worth considering for future generations to reminisce. Jews in our post-gentile modern world don’t believe in anything. They don’t even make a show of believing in God let alone making a pretense of it. Jews are atheists in the main stream, secularists in the majority, and irreligious in their manipulations. Why else would they clamor for war? They’ve infiltrated both parties leaving the hapless country without a choice of political preference. It’s a matter of what flavor of Jewish control the goy gets, Republicanish yiddishee flavor? or Democratish yiddishee flavor. What Eliot affirms is that like a mole dug into society’s mold, the ‘free-thinking’ Jew will chew up its unity, effeminize its will, and annihilate its moral purview. Well sure. There’s Zionist Jews, anti-Zionist Jews, pro-Israel Jews, not-so-pro-Israel Jews, pro-Trump Jews, anti-Trump Jews, pro-right Jews, pro-left Jews, pro-Russia Jews, anti-Russia Jews, pro-Muslim Jews, anti-Muslim Jews, and so on and so forth. The question has befuddled many a goy who have come under the spell of Jewish moral-high-ground posturing. For the Jew doesn’t simply have a position per se, but superseding any given stance on any given subject is that the Jew dictates his position from a Lectern. He sees himself as a ‘light to the Gentiles’ while enshrouding the goy in darkness. JEWS UNDERSTAND THIS DEVICE better than a goy can, simply because the Gentile just wants to live his life. But life is not worth living for the Jew unless his mastery over the goy is comprehensive and not resisted. The goy who has come under the influence of ‘political correctness’—a masterful ploy of the Jew to bring the goy into a state of self-censorship—has saved the Jew many a dollar in his efforts to bind the boundaries of discourse by more expensive means. The Jew realizes that the goyim are prone to shift from one opinion to another based on the ‘Catch Phrase Of The Day.’ Trump is the perfect example. One day he says, “Russia is okay,” the next, “Russia is not okay.” It depends on what ‘Jew Counsel Of The Day’ he gets. 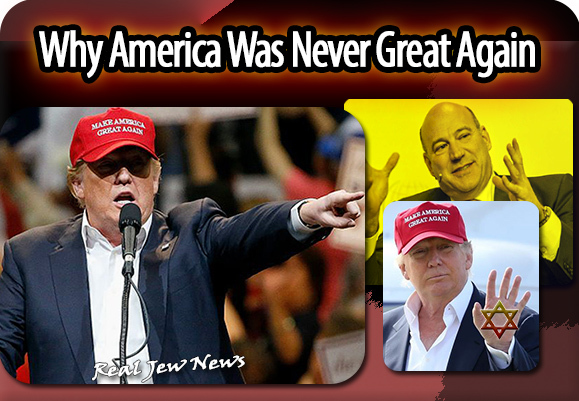 Which brings us to a fatal conclusion, America was never great again, it didn’t happen, it could not happen. The Jew had by 1913 so definitively taken over America by bringing his printing press to the precincts of DC so that any recovery by the Gentile would take a yeoman’s effort. The goy simply didn’t have it in him. He was either on the payroll of the Jew or so snowed-under that he couldn’t even grasp the obvious message of Little Orphan Annie’s character, Daddy Warbucks. The rest is history, Jewish history. Perhaps the end of history for Americans. The ruining of their country is strictly a Jewish affair. And: Seeds Of America’s Collapse Here! I need help, can anyone help me? I’m at the edge of financial ruin due to declining donations which is plunging rapidly. I’m maxed out on credit cards. Ever since PayPissed banned me very few are willing to use my alternative venues. I really value and agree with what you share. Yet I do hope you are incorrect about Trump. I hope he is playing both sides to our favor in the end. Like dude seek and ye shall find…Rev 3:9. Jews are satanic to their Talmudic core. As usual excellent article, Br. Nathanael. Because Trump is Ger Toshav for Satan’s Sinai-GOG…..
Hello Brother Nate. Honest and concise as usual. Give me honesty over political correctness EVERY time. I’m a long time admirer of you Dr. Kapner but avoided being public for obvious reasons. Not being as courageous Jew as you once were, or still are in many aspects, I tried to avoid the controversies that place on our dinner tables of, as you know, most of our Jewish families with so many dissenting views and some. I fully concur with your thoughts and opinions almost all the time but as you know we Jews are brought up in such an isolated mind-controlled indoctrination that it is almost our instinctive reaction to, so loosely fanned and manipulated nonsense of “antisemitism” that a great many liberal Jews laugh at the shear success and its overwhelming power that if its wrath is laid upon a poor gullible wide eyed Goyim, he is finished from whatever he has planned, toiled, and spent his/her life doing in the past! Like to find some ways to work with you in any possible ways. Now that I have decided to come out in the open, and see what befalls ahead! Thank you so much for your great work and may the Lord keep you safe and protected from the evil doers of Talmudic Zionist Mafia (TZM) and their cohorts in our midst while walking with you as the Christians who have sold their souls to the devil! Is President Bad Hair a crypto-Jew? Did his daughter convert or just come out of the closet? Would Orthodox Jared have married a shiksa? Ivanka is a ‘half-shiksa,’ but according to Talmudic law, a full Jew. Why? 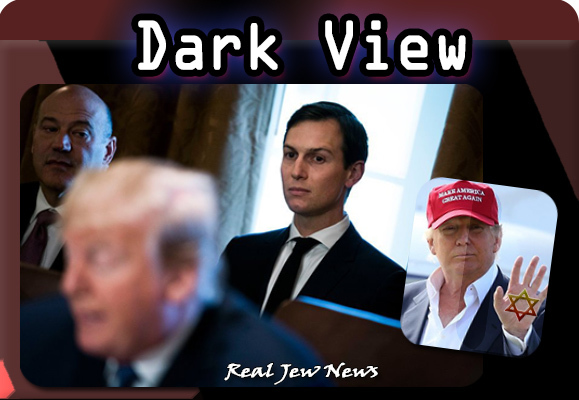 Her mother Ivana is a Jew, and that’s all that counted for the Kushner family since according to Talmudic law one is considered a Jew through the mother. There are no records of Ivanka going through the mikvah, (Jewish conversion ceremony of Gentile women), she didn’t have to since she was already considered a Jew through her mother Ivana. Technically, a Jew can’t be a Jew and an atheist at the same time. Certainly, a Jew can not believe in Yahweh–I’ve met many–but unless a Jew believes in “The Divine Destiny of the Jews” he’s really not a Jew. Consequently, if he does believe then he’s not an atheist. Life is not worth living for the Jew? It never has. Their Talmud belief system will not save them. Their Lucifer Protocols of the Elders of Zion proves their intent. They will fall just like the way they brought down Twin Towers on 9/11 . I despise idiots who believe cuck war monger lying subversive Neocon scum like Michael Savage amd Sean Hannity. The Ziomedia and MIC are evil lying shysters. The following youtube video gives a good documentation and explanation of how today’s Jewish leadership are dishonest to their own Jewish people in the Hanukkah celebration story. Hanukkah is actually about a miracle that was part of the rededication ceremony for the second temple in Jerusalem, after the second temple was captured and desecrated by the Greeks inabout 167 BCE, and then recaptured and purified by the Jews. Part of Hanukkah story today is the lie ( or rather the intentional error implication ) that the wailing wall is a part of this second temple of the Hanukkah story which God preserved to remain for the Jews today. But the truth is that the second temple has nothing remaining for almost 2000 years. So, doesn’t it seem strange that an important part of the Hanukkah story is missing and not ever mentioned, that the second temple has been “completely” gone for almost 2000 years ? “The religion, or anti-religion, of the “free-thinking Jews” that Eliot had in mind was not Judaism, but rather secular humanism (a term employed by Eliot’s friend Christopher Dawson). Something that sticks in my craw is the constant presence of Hollywood’s Oliver Stone with Putin and on Russia Today. Even VT runs his stuff. They should know better. His son is on that stupid program “Watching the Hawks” where you get information, they call news, that has been readily available elsewhere on the Internet, for the last two years. Watching “Watching The Hawks” is like reading old newpapers that you find in a dumpster behind Walmart. Stone is also best friends with and has worked with confessed Mossad Agent Arnan Milchan and convicted child molester Roman Polanski. I haven’t looked at Stone’s Kennedy film but I am sure it will eventually be outed as pure disinfo. I always assume that anything that is linked to his name is B.S. A very strange Jewish death has been reported in the Toronto Sun Today that may be of interest to dot connectors. So far it sounds like the Jewish Pharma $billionaire Barry Sherman (net worth $4.5 billion), a good friend of Paul Godfrey and the “Axis of Evil” Frum Family appears to have hung his wife from a staircase and then hung himself, but authorities are treating it as “suspicious”. They had everything anyone could want, house on the hill, tons of money, plus four kids. If it proves to be a murder/suicide you have to wonder what the motive was? What skeleton was in the closet? Addenda - There have been other murders linked to $billionaire Canadian Jews. Peter Monk’s one time business partner David Gilmour (I have also seen him referred to as David Yellen?) had a 22-year old daughter murdered more than 20 years ago in Toronto. The case has never been solved. Monk and Gilmour were joined at the hip with companies called Clairetone (failed) and another called Southern Pacific Resorts. They had to be pretty good businessmen to operate successfully down there. The South Pacific is a tough place to operate because it is famed as a center for money laundering for organized crime. You have to wonder if these $Billionaire linked murder/suicides are in any ways connected to the company these people end up meeting? Addenda, I just looked at a Toronto Star article that said the police believed the Gilmour murder was the result of a serial killer because another woman had been killed the same way. However, it has now been more than 20 years and the crime remains unsolved and there do not appear to have been any more similar “serial” killings. To me that either spells a serial killer who found God, or else a “hit” and not a serial killing. Clearly $ billionaire jews need to be careful of the company they keep. No wonder Gilmour now lives on his own private Island in the South Pacific and no wonder Jeffrey Epstein lived on his own private Island in the Caribbean. There have also been many prominent and $billionaire Russian jews murdered recently. My advice to these jewish $billionaires is that if they want to lead long and happy lives they ought to spend as little time as possible hanging out with other jews. How can a nation be great if it stupidly floods itself with millions of immigrants utterly alien in their mentality, culture and ethics? Odds are if +BN digs he will find out likely reasons why that Canadian big Pharma Jew billionaire and his wife were found dead in their Mansion. +BN has a real knack for research and expose’ work. I haven’t read anything about it, but to construct an arbitrary theory right here on the spot — the odds are he did something in his actions or behavior to conflict against the interests of someone higher up the food chain in the JWO than himself. So the cabal sent a team in to take him out and make it look like a suicide. I think that’s what they did to rock singer and family man who loves his kids-Chris Cornell because, Chris supposedly had info on (((Entertainment Industry))) pedo rings and (((they))) didn’t want that info to see the light of day. This was a great piece, +BN, one of your best. The seeming contradiction and constant argument among Jews is useful (to Jews) on many levels. First, it keeps the discussion from ever getting around to core principles. Like arguing constantly about “1967 borders” for Israel, when the real issue is that nearly every square inch is stolen property. Second, it keeps the enemy goyim confused themselves, and confused on where the Jew really stands. “Divide and Distract” I’ve heard it called. Third, it provides “cover”. “See…. there are good Jews like ME” said one fake anti-Zionist to the next. Fourth, to create labels and divisions, which lead goyim astray. There really is no such thing as an anti-Zionist Jew, any more than there is an anti-Christ “Christian” or an anti-Allah Muslim. But the fake category dilutes the impact of any criticism. I can’t count how many times I’ve had some clown jump on my case for using the word “Jew” instead of “Zionist,” when everyone knows they’re the same, ideologically speaking. When you create labels, you can always switch labels later on when it suits your purposes. And fifth, most importantly I think, is that the “noise” creates a culture that worships “noise”. The New York Times deals 24/7 in noise, it NEVER, ever, cuts to the chase to get to the underlying issues in any meaningful way. Now it is accepted as “normal” to argue about (and with) “noise,” and nothing else. The more you can enlighten us goyim to the twisted nature of the Jewish psyche, the better. No one does that better than you, +BN. “Know thy enemy,” a wise ancient once said. The big problem white European Goys have is that far too many of them lack a morality that includes their own existence. They have no real awareness of their own racial identity or the need for its preservation, purity and propagation. It makes them easy for the Jews and their allies to exterminate by any means. Br Nathanael all the players in the 911 fiasco were Jews but they had the gentiles in their servitude. It’s a two headed horse that needs to be destroyed simultaneously. They get researchers to focus on one or the other and to fight amongst themselves over it, all the while laughing their heads off at your stupidity blindness and consequent defeat, or is it simply a weakness of character that leads their opponents into their trap? Those that point out this mistake will be considered as mad the Protocols state - try reading them and learning from knowing your enemy. The only alternative tragically is to become your enemy. Christ was not a warrior leader. He taught love. Mohammed was a warrior leader. If you read the Talmud or Kabala or the Protocols Jews seem to preach and live by treachery combined with primitive and ancient formulas for instant gratification and centralization of power in their Hands. They use old but shop worn magik numbers such as 6 Million and 666 which everyone is gradually beginning to realize. When treachery meets trust and love, treachery will always win — for a while — but it will eventaully begin to stumble and unravel, and mostly because of Bro Nat that process has begun. Hollywood, for example, is beginning to fall apart. I think, this is happening because of Bro Nat, more than anyone else on the internet because, as former Jew, he has the inside track. The only useful whistleblowers are on the inside. The rest, like myself, are just dot connectors and never really get it quite right. We have major blind spots. Bro Nat is not talking about Zionist values, or Chosenite values, or the Usual Suspect values. He is really talking about truly primitive Jewish values from the Talmud and Kabbalah, and only Bro Nat really goes there. Everybody else is following him, but a good two to three years later. Its very lucky the First Amendment is out there or the whole thing would be hopeless. I was hoping Nathanael would do an annual piece of their Hoax Hanookey celebration and their temporary wannabe conquering of Christ Jesus saints…. As for me. I learned the hoax and fables of the chosen long ago, in part thanks to Gabe Kapner. The only people the Jews have succeeded in totally brainwashing are…THEMSELVES! It seems like the Zionist power got a good foothold on the reins of this country around 1913, but there was still awake people and strong resistence among the masses. Unfortunately, the “straw” that did the most to break the gentile “camel’s back” was the “holocaust”. I can donate you through bitcoin cash. Pl send me your bitcoin cash address. The rapper Eminem is yet another sad and pathetic example of celebrities wrapping themselves in Jewish-leftist clothes. If you’re familiar with his career, he’s one of the most controversial, but at the same time the most successful rap artist in history. He’s clearly very talented though basically clueless politically. His new album may be summed up as a diatribe against Donald Trump’s conservative domestic policies (illegal immigration for example). Yet if you read this interview he has nothing but love for the previous Jew-created charlatan, President Obama. Nearly all celebrities in the entertainment industry (Jew controlled), be it the music world, television, movies, whatever — aggressively promote Jewish-Marxist ideas and causes. But one would think that at least some rich and established entertainment icons would be smart and brave enough to advocate more conservative (really anti-Jewish) causes. Ditto for very rich and famous Americans like Bill Gates or Warren Buffett, or whoever. They all advocate and donate their money to Marxist/Jewish causes and politicians. Christianity is seldom ever defended, advocated or even mentioned. Why don’t they ever donate some of their dollars to websites like this one, even in private?? How could they be so ignorant or afraid to ever take a stand or donate to any conservative or libertarian cause, even something less controversial or eyebrow-raising such as say, ending the Federal Reserve or opposing Israel. Eminem himself has a popular song called “Not Afraid” where he boasts of his courage and taking on the world, in almost messianic tones. But today he’s sounding more and more like a giant fool and coward just like rest of elites in America! The only time America was great again in the 20th Century, Br. Nat, was during the brief presidency of John F. Kennedy. JFK was a veteran of the Pacific Theater of WWII; so, he knew exactly what courage was. His experiences in that war served him quite well, so when he became President, he decided to do what Donald Trump would refer to years later as to “Make America great again”. One thing JFK knew was never trust the Jew; he learned that from his father, Joseph P. Kennedy, as a child growing up. As President, he stood up to the Trotskyists aka neocons and to Israel regarding nuclear weapons. America would’ve been made great again on JFK’s watch, had he not been assassinated. He was the only POTUS who actually issued/signed an Executive Order abolishing the Rothschild Central Bank aka “Federal Reserve” and had the Treasury print up dollars backed up by silver. He also was the only President since the creation of the Zionist Entity of Israel to demand access by IAEA inspectors to Israel’s Dimona Nuclear Facility located in the Negev Desert to inspect it and ensure there were no nuclear weapons within its walls. Six weeks later, he was assassinated. He was only 46 years old. None of his successors even tried to do what he did; they were afraid of the Jews; whereas, he wasn’t. Keep up the good work, Br. Nat; even though donations aren’t coming in as much as they used to, you’re still waking more and more people up to the deadly danger World Jewry’s presenting to this nation. God bless you, and may you have a Merry Christmas and a New Year filled with His blessings. The $billionaire Barry and Bunny Sherman deaths in Toronto have taken a new twist. This guy was involved in more than a hundred law suits, the most recent seeming to be over an allegation that he somehow illegally funded Justin’s Trdeau’s Liberal Party. Trudeau’s bagman, a Bronfman is a direct descendant of Sammy Bronfman, Al Capone’s supplier boss during prohibition. Sherman’s wife has been described in the Toronto Star, by friends, as “pushy” so perhaps they irritated the wrong people. Also they gave huge amounts of money to a Jewish foundations in Toronto, but the main foundation won’t admit to just how much or what it was used for. Its illegal to finance a foreign army like the IDF in Canada, but it gets done, and makes you wonder if journalists should not run this possiblity down. Then they supported the Simon Weisenthal Center in Israel. Its beginning to sound like they hung around with the wrong crowd, maybe missed a payment and paid the price. Rich Jewish billionaires seem to be increasingly gravitating to far away gated and guarded islands in the tropics, buying entire country hideouts like Peter Monk did with Montenegro (which now also serves the Israeli Military), or living in London surrounded by hired Gurka bodyguards. Its beginning to look like the monster is now eating itself up and running with the wolves. Wolves, as you know, all birds of a feather, will eat each other. Here’s a very good piece posted Rense on the differences between Russia and America. “By contrast, compassion is actually a national value of Russia: this attitude derives richly from Russia’s Orthodox Christian theology of humility, asceticism, and brotherly love. “Spirituality in general in Russia, expressed as well by her other heritage religions of Islam, Judaism, and Buddhism, influences everyday life in ways connected with compassion and empathy: mysticism with its understanding of the sacred, kindness to all living creatures, and almsgiving to the less fortunate all play a role in how the citizens of the Russian Federation interact with each other. Perhaps their are some wealthy Russian financial donors who could assist you Brother Nathanael? I have donated some before and will again. Everyone reading this site should send a Christmas donation to Brother Nathanael.